When it comes to your favourite food, fewer things taste better than your beloved dishes being cooked by someone else. All you have to do is sit back and enjoy the meal. But what about making those classic pub dishes at home? 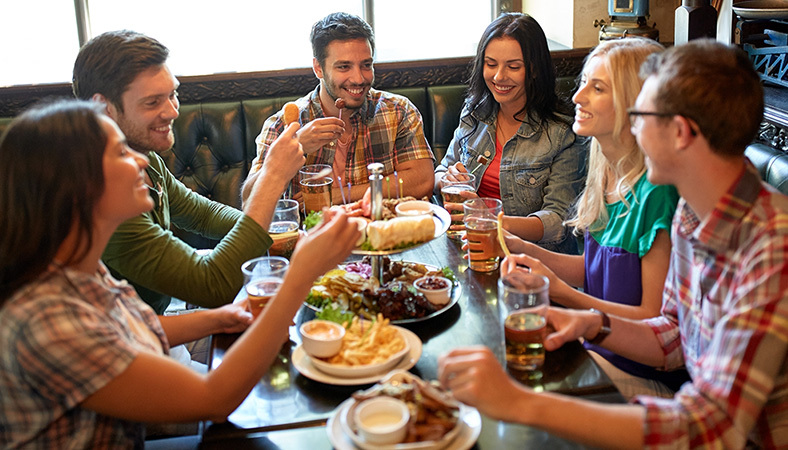 We asked you for your favourite pub classics that you’d like us to recreate and we listened. So, we tasked three food bloggers to come up with an alternative version of your pub classics. With healthy fish and chips, healthy steak and chips, and a vegetarian Sunday roast, there’s something for everyone, and you won’t even need to leave the comfort of your home! 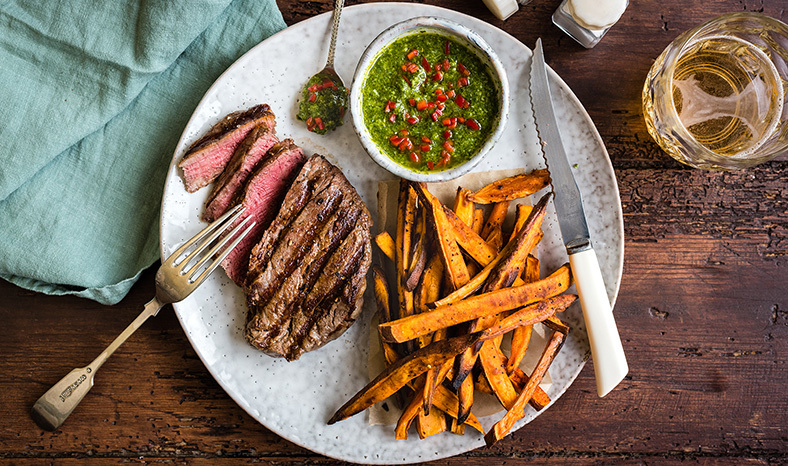 For a healthier take on the classic steak and fries, why not go for this exclusive oven-baked sweet potato fries and tangy chimichurri sauce recipe from Super Golden Bakes? You will need to time baking the fries and griddling the steak so that they both are ready at the same time. Also, make sure to rest the steak before serving. Put all the ingredients in a food processor or mini chopper and pulse until liquidized. Add the chopped chili and mix together. Take the steak out of the fridge and bring to room temperature before cooking. Season the fillets with salt and pepper. Heat a heavy griddle pan on the stove top until very hot. Brush with rapeseed oil. Use tongs to lay the steaks flat on the pan and leave them to cook for 2-3 minutes. Lift the edge with the tongs and check the meat – if it is well browned, turn over. Cook 4-6 minutes for rare, 6-8 for medium and 8-10 minutes on each side for well done. Preheat the oven to 220°C (200Fan). Slice the potatoes into thin strips, no need to peel them. Put in a plastic bag together with the olive oil and seasonings. Shake to combine and spread on a heavy baking tray in a single layer. Bake, rotating the tray and turning the fries halfway through, until golden and crisp, 20 to 25 minutes. Remove the steak from the pan and leave to rest for 5-8 minutes, loosely covered with foil. Serve with the sweet potato fries and chimichurri sauce on the side. You voted a Sunday roast as one of your favourite pub classics so we asked Becca from Amuse Your Bouche to come up with an alternative twist. 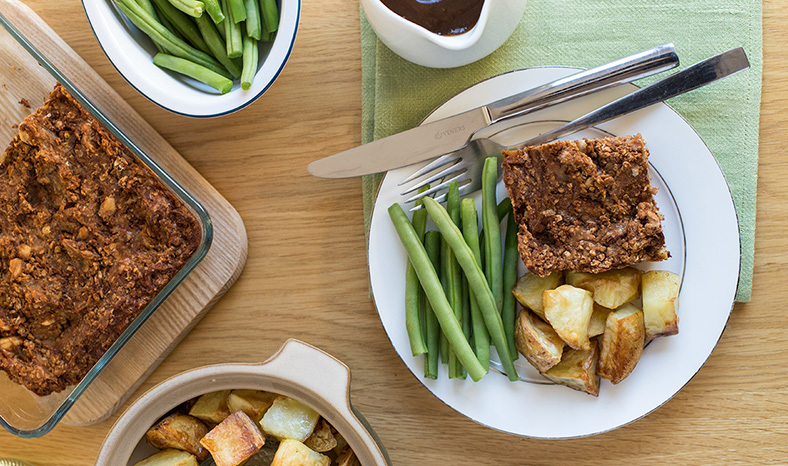 This tasty Mexican bean nut roast can be ready and on the table in just 55 minutes! Combine all of the ingredients in a large bowl, and mix thoroughly. Season well. Transfer the mixture to a lightly greased baking dish, and spread it out into a single layer. It doesn’t need to be completely smooth; the rougher you leave the surface, the crispier it will be. Bake for around 45 minutes, until firm and crispy. Then cut into squares to serve. 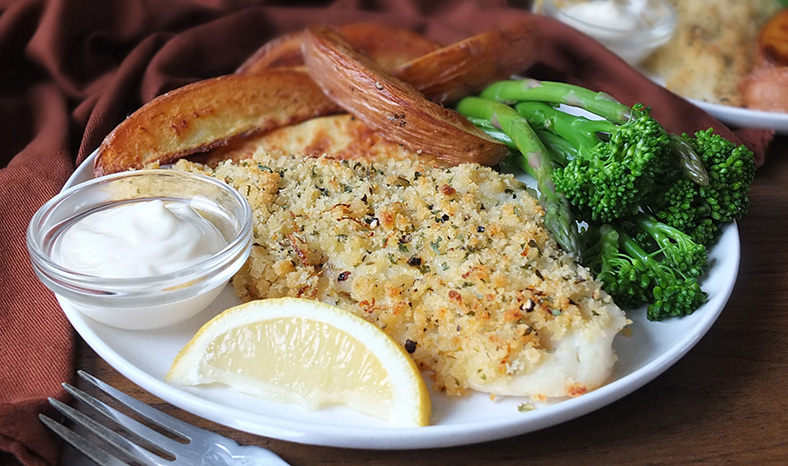 If you’re a fan of fish and chips but looking to reduce your calorie intake, these Lemon and Cracked Black Pepper Crusted Cod Fillets from Elizabeth of Elizabeth's Kitchen Diary were made exclusively for Beko. And better still… you can prepare and cook this dish in less than 45 minutes! Preheat oven to 200°C/ 180°C fan. Slice your potatoes lengthwise in half, and then into quarters, and halve each quarter, forming 8 chunky potato wedges with each potato. Place the potato wedges into a bowl, drizzle with the oil and season well to taste. Mix together with your hands making sure the potatoes are lightly covered in oil. Arrange the wedges in a single layer on a baking tray and bake for 30-35 minutes, turning after 15 minutes (add the fish when you turn the wedges). Mix the breadcrumbs with the parsley, lemon zest and salt and pepper. Make a little baking tray with a piece of aluminium foil big enough for your cod fillets. Melt the butter and brush a little over each of the cod fillets. Squeeze the lemon juice into the remaining butter and drizzle the lemon butter over the breadcrumb mixture, gently stirring with a fork to combine. Lightly press the breadcrumb mixture onto the top of each cod fillet. When it comes time to turn the potato wedges, carefully move them to the outside edges of the baking tray and pop your cod fish, aluminium tray and all, into the centre of the baking tray. Bake for a further 15-20 minutes, depending on the thickness of your fish. To make the lemon mayo, squeeze the lemon juice into the mayonnaise, add the zest and mix well. Serve the fish and chips with a little bowl of the lemon mayo and some steamed green vegetables. Whether it is a healthy version of your favourite catch of the day or a vegetarian roast to cater to all eaters around the table on a Sunday afternoon, we have an alternative pub classic for you.